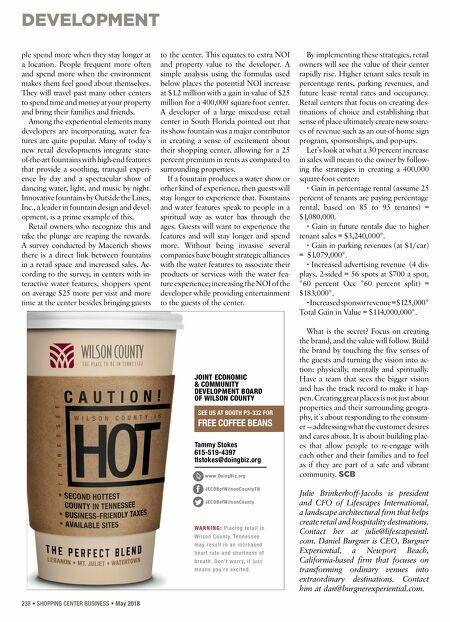 DEVELOPMENT 238 • SHOPPING CENTER BUSINESS • May 2018 ple spend more when they stay longer at a location. People frequent more often and spend more when the environment makes them feel good about themselves. They will travel past many other centers to spend time and money at your property and bring their families and friends. Among the experiential elements many developers are incorporating, water fea- tures are quite popular. Many of today's new retail developments integrate state- of-the-art fountains with high-end features that provide a soothing, tranquil experi- ence by day and a spectacular show of dancing water, light, and music by night. Innovative fountains by Outside the Lines, Inc., a leader in fountain design and devel- opment, is a prime example of this. Retail owners who recognize this and take the plunge are reaping the rewards. A survey conducted by Macerich shows there is a direct link between fountains in a retail space and increased sales. Ac- cording to the survey, in centers with in- teractive water features, shoppers spent on average $25 more per visit and more time at the center besides bringing guests to the center. This equates to extra NOI and property value to the developer. A simple analysis using the formulas used below places the potential NOI increase at $1.2 million with a gain in value of $25 million for a 400,000 square-foot center. A developer of a large mixed-use retail center in South Florida pointed out that its show fountain was a major contributor in creating a sense of excitement about their shopping center, allowing for a 25 percent premium in rents as compared to surrounding properties. If a fountain produces a water show or other kind of experience, then guests will stay longer to experience that. Fountains and water features speak to people in a spiritual way as water has through the ages. Guests will want to experience the features and will stay longer and spend more. Without being invasive several companies have bought strategic alliances with the water features to associate their products or services with the water fea- ture experience; increasing the NOI of the developer while providing entertainment to the guests of the center. By implementing these strategies, retail owners will see the value of their center rapidly rise. Higher tenant sales result in percentage rents, parking revenues, and future lease rental rates and occupancy. Retail centers that focus on creating des- tinations of choice and establishing that sense of place ultimately create new sourc- es of revenue such as an out-of-home sign program, sponsorships, and pop-ups. 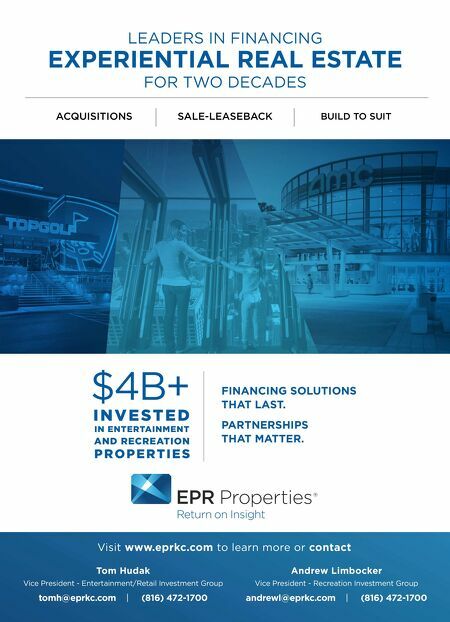 Let's look at what a 30 percent increase in sales will mean to the owner by follow- ing the strategies in creating a 400,000 square-foot center: • Gain in percentage rental (assume 25 percent of tenants are paying percentage rental, based on 85 to 95 tenants) = $1,080,000. • Gain in future rentals due to higher tenant sales = $3,240,000*. • Gain in parking revenues (at $1/car) = $1,079,000*. • Increased advertising revenue (4 dis- plays, 2-sided = 56 spots at $700 a spot, *60 percent Occ *60 percent split) = $183,000*. • Increased sponsor revenue = $125,000* Total Gain in Value = $114,000,000*. What is the secret? Focus on creating the brand, and the value will follow. Build the brand by touching the five senses of the guests and turning the vision into ac- tion: physically, mentally and spiritually. Have a team that sees the bigger vision and has the track record to make it hap- pen. Creating great places is not just about properties and their surrounding geogra- phy, it's about responding to the consum- er — addressing what the customer desires and cares about. It is about building plac- es that allow people to re-engage with each other and their families and to feel as if they are part of a safe and vibrant community. SCB Julie Brinkerhoff-Jacobs is president and CFO of Lifescapes International, a landscape architectural firm that helps create retail and hospitality destinations. Contact her at julie@lifescapesintl. com. Daniel Burgner is CEO, Burgner Experiential, a Newport Beach, California-based firm that focuses on transforming ordinary venues into extraordinary destinations. Contact him at dan@burgnerexperiential.com. JOINT ECONOMIC & COMMUNITY DEVELOPMENT BOARD OF WILSON COUNTY SEE US AT BOOTH P3-332 FOR FREE COFFEE BEANS Tammy Stokes 615-519-4397 tlstokes@doingbiz.org ––––––––––––––––––––– w w w. Doi ng Bi z .org J E C D B o f W i l s o n C o u n t y T N J E C D B o f W i l s o n C o u n t y WA R N I N G : P l a c i n g r e t a i l i n W i l s o n C o u n t y, Te n n e s s e e m a y r e s u l t i n a n i n c r e a s e d h e a r t r a t e a n d s h o r t n e s s o f b r e a t h . D o n ' t w o r r y, i t j u s t m e a n s y o u 'r e e x c i t e d .